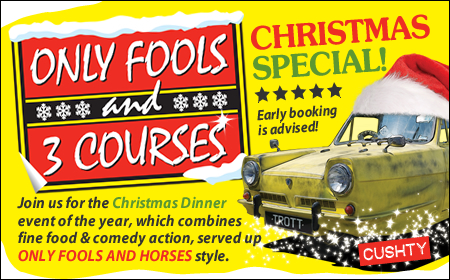 Back by popular demand – the talented actors of Comedy Dining will be entertaining us once again with the Only Fools and Horses Christmas Special. Save the date, Saturday 8th December 2018. Tickets are already selling so if you want guaranteed pre-Christmas laughter and a great home-cooked 3-course meal, then don’t delay – get your tickets now! And, of course, you get the very classy glass of Pimms and fruit cocktail on arrival – cushty! Full details here and menu selector here. Our best rates are only available when you call our friendly team.